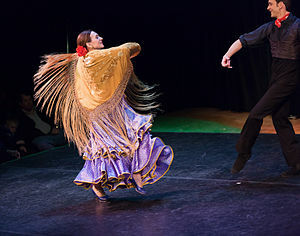 Flamenco dancing is seen as one of the most typical images of Spain. The music, the swirling dresses, the stamping feet all add to the magic of this beautiful dance form. With the economic crisis, however, more and more dancers are having to leave their native Spain to find work. There are at least 44 Flamenco festivals held round the world in places as diverse as Poland, Turkey, Japan and Canada. Although they know that they will get paid less, performers still move abroad because they know they will get far more opportunities to dance. Britain and the USA are currently the biggest markets for Flamenco festivals. Flamenco, which covers the dance style, the singing and the guitar playing that go with it, originated in southern Spain, in Andalucia, and was originally associated with the Romani (or Gypsy) people. It was first mentioned in literature in 1774. No-one is quite sure how the name came out. Literally translated in modern Spanish it would come out as ‘flamingo’ but it’s believed that originally the name grew from ‘flama’ which is flame or fire and describes the dramatic style beautifully. The proud bearing of the women dancers with their graceful arm movements and rapidly stamping feet of the more traditional style has developed, like other dance forms, into more free flowing moves such as those performed by perhaps the best known male dancer, Joaquín Cortés. So popular has the dance become that you will most probably be able to go along to a class in your local city to learn the most basic style, known as ‘Sevillanas’ or attend a performance by some of the world’s best known performers at festivals in cities like London, New York, Tokyo, Moscow and many more.